AGNA COM Exhibition and Congress 4-6 June 2013, Cologne/Germany (Photo: AGNA COM)The Association of German Cable Operators' annual trade show has a new name. 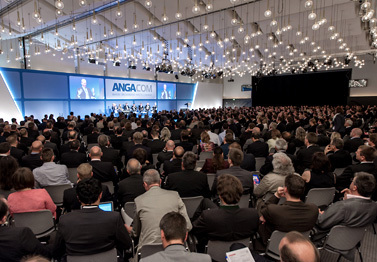 Europe's principal cable industry exhibition and convention was previously known as ANGA Cable, but last week (June 4-6, 2013), the show launched as ANGA COM. This new title — an abbreviation of communication — highlights how the convergence of technologies and networks is blurring the line between cable operators and other communication and entertainment services providers. This new focus was reflected in the many service-oriented sessions centered on broadband, video, and all forms of entertainment delivered to consumers via various modes of access technologies. The annual convention in Cologne, Germany, brought together broadband, cable, and satellite operators, as well as their vendor partners. For the first time, major telcos Deutsche Telekom and Vodafone were invited and took to the stage to discuss trends, technologies, and how broadband is working to deliver content. Germany is a major player in the cable industry and holds the lion's share of cable homes in Europe, with 18 million households subscribed to cable. Digital transition has helped drive cable adoption, and today, about half of all German cable households use digital TV packages offered by broadband cable, especially HDTV, VOD, DVR, and TV sets with integrated digital receivers. The German cable industry is poised for further growth, with Europe's largest cable operator, UPC — which operates cable services in 13 European countries — citing Germany as its "growth engine" and the company's CEO stating that some 40% of the UPC's growth comes from this country. Of course, cable faces fierce competition in Europe, as it does elsewhere in the world. Recent research from IHS Screen Digest shows that during the five-year period from 2007 to 2012, European cable operators lost 1.4 million subscribers. So where did the growth come from and why did convention attendees seem so upbeat about cable's future, as evidenced by the show's record number of 16,000 attendees and 450 exhibiting companies? The fact is, it's not all doom and gloom. The same IHS research shows that cable actually gained 17.8 million more revenue-generating units (RGU) during the same five year period that it lost subscribers. RGU drives total revenue growth and is a positive sign for an industry facing fierce competition from traditional telcos, satellite, and OTT players. Value-added services have been made possible by the growing number of available consumer devices — tablets, laptops, PCs, and smartphones. These new services include home security and Wi-Fi, both in and around the house, as well as in public areas. Multi-screen services are also enabling cable operators to offer OTT-like, proprietary video services. These offerings are becoming essential as consumers demand easy access to content as they move from room to room inside the home, as well as outside in public places such as stadiums, theaters, and shopping malls. It's not surprising, then, that multiscreen was a hot topic at ANGA COM, along with the usual topics of fiber expansion, IPTV, video on demand, smart TV, software solutions, and consumer electronics. For an uninterrupted multi-screen experience, consumers need to be able to easily access content across devices, and device provisioning and service activation should occur seamlessly. This enables customers to enjoy the same quality of experience across multiple devices, both inside and outside the home. At the same time, service providers need to be aware of security concerns associated with the multi-device consumption of content — particularly security of content and consumer privacy. Operators are also turning their attention to the monetization of services associated with multiple-device use. Clearly, the multi-screen experience is changing the dynamics of customer services and technical support. Consumers want ease of use and an uninterrupted experience, where they can simply order a service that is then provisioned so quickly that they don't even realized it's happened, and everything works without any issues. For operators, this type of experience requires network reliability and for customer service representatives (CSRs) to have all the necessary information and tools at their fingertips for fast issue resolution. The demand for quality of experience puts pressure on service providers to understand subscriber usage behavior patterns. Solutions from vendors like Incognito offer operators ways to construct meaning out of the massive amount of bandwidth utilization data that they accumulate, and enable them to use that intelligence to improve the user experience. ANGA COM provided an excellent opportunity for us to catch up with customers and partners, and strategize ways to take advantage of new technologies to provide a better service for customers and their subscribers. Bring on ANGA COM 2014! Local Time: Thursday, April 18, 2019 09:29 AM PDT – Page Load: 0.2714 Sec.